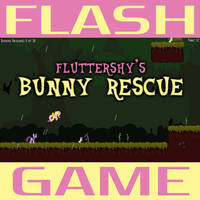 Play as Rainbow Dash and Spike as a swarm of Parasprites come through. Use Spike to shoot fireballs and burn these little feathered balls. 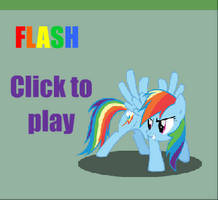 You also have your Rainbow Power which allows you to use powers such as rapid fire and rainbomb on collision. You have your score and level that goes up as you gain points. The higher the level, the more Parasprites. 2.94: In preparation of the next boss. -New preview pic. Hope you guys like it! -Gilda has been changed around a little bit. 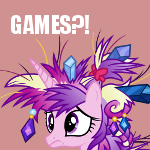 She now throws pegasi and pillars, save the pegasi to earn extra points! 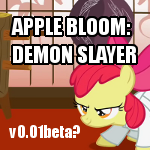 -Fluttershy's stare has been changed to a new skill I learned. Bitmap Displacement Filter! -Finally got the Red Parasprite in! It grows as you shoot it and then explodes. Watch the fire from the explosion, fire doesn't take sides. Ok, I think that's all. Sorry for the wait. I'm juggling Android projects here as well. I'll be waiting a little bit before starting in case there are other bugs that I've missed. After that, I'll be posting my development update journals as usual and extend this game further. Hopefully getting such high scores wont be so easy now with the bug fixes and exploit patching I've been doing. The Rainboom takes more rainbow juice now, and rainbow juice frequency has risen. 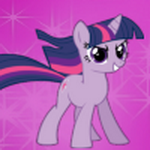 Good luck in the competition for 2.94 eveypony! OC Gilda bug now fixed. Enjoy playing as OC again without Gilda constantly coming back to life! Kiss your hand 3 times then post this to 5 other games then look under your pillow for a pink laptop. Still amazing, I always come back to this game! To defeat Gilda, You'll need to use Spikes charge up Fireball to knock the wind out of her. Can someone tell me what are the name songs ? Read the credits, one is "rave n' dash"
Warning! Don't carry on reading, or you won't die, you'll just waste you're time! Once there was a little girl called Clarissa, She was ten-years-old and she lived in a mental hospital, because she killed her at . She got so bad she went to kill all random s in china. So the goverment decided the best idea was to get rid of her so they set up a special room to kill her, as humane as possible but it went wrong. The machine they were using went wrong but . She sat there in agony for hours untill she died with on her head. Now every week on the day of her death she returns to the person that reads this letter, on a random night at 12:00a.m. She creeps into you're room and gives you . And makes you fat.Apparently,this is fake. No matter what you do. It dosen't matter weather you copy and paste this on another game or not. in a few days someone would probably say something to make you stop this because they hate spams. My Notes: This is just to make you guys feel better. And just to tell u that these things aren't real. Please copy and paste this on other games so other people know as well, But its okay if you don't wanna. Anyways, Cya! How do I make sure my OC stays loaded? 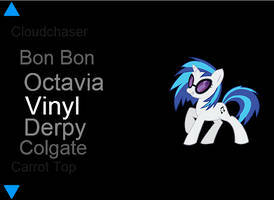 i've been wondering what derpy's code is..
omg how do u deafet glida?? Whats the next boss after Gilda? This game looks pretty cool, not to mention this is something I would also see on Newgrounds. 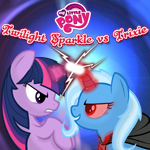 The Trixie boss is confusing though. Can't Fluttershy just let go of that rope herself? If she can't let go of it with her mouth, i'm sure her hoofs can do the job for her. 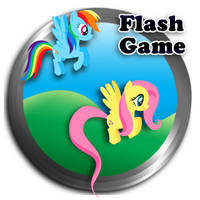 Just ask the creator why fluttershy doesn't scape... OBIUSLY!!! I got to Level 26, What level did you guys get to? 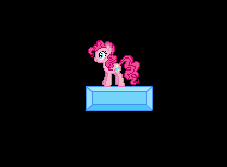 I MADE JACKSEPTICEYE AS A PONY!! !